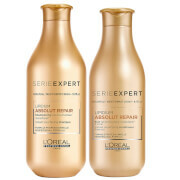 The L'Oréal Professionnel Absolut Repair Lipidium Shampoo and Masque Duo is the perfect pairing to leave hair feeling soft, supple and replenished. 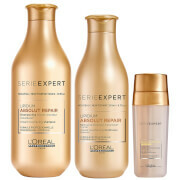 An instant reconstructing shampoo that has been inspired by skincare treatments. Like skin, hair is made of different layers that can suffer from lipid-deficiency. Loss of lipids are caused by chemicals, heat styling and external aggressors including sun, salt and chlorinated water. Lipid-deficient means hair may break easily, styling will become difficult, coloured hair will fade and textured hair will lose its bounce. 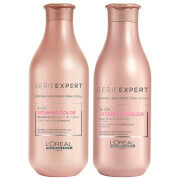 This technological breakthrough shampoo contains the most reconstructing ingredients to replenish all hair zones and create an insulating barrier to lock in essential nutrients to restore healthy-looking tresses. A deep conditioning masque that has been inspired by skincare treatments. Like skin, hair is made of different layers, that can suffer from lipid-deficiency. Loss of lipids are caused by chemicals, heat styling and external aggressors including sun, salt and chlorinated water. Lipid-deficient means hair may break easily, styling will become difficult, coloured hair will fade and textured hair will lose its bounce. This technological breakthrough masque contains the most reconstructing ingredients to replenish all hair zones and create an insulating barrier to lock in essential nutrients to restore healthy-looking tresses. Shampoo: Distribute the shampoo evenly through your wet hair and lather. Rinse thoroughly and repeat the process for an extra targeted cleanse. Hair Mask: Either replace your conditioner with this mask or use it occasionally for an extra nourishing feel. Leave it on your hair for 3-5 minutes and then rinse it our thoroughly.